It’s September so it’s time to roll out the apple and pumpkin recipes; never mind that it’s well into the 90s here in Atlanta, I’m ready to be in full fall mode. 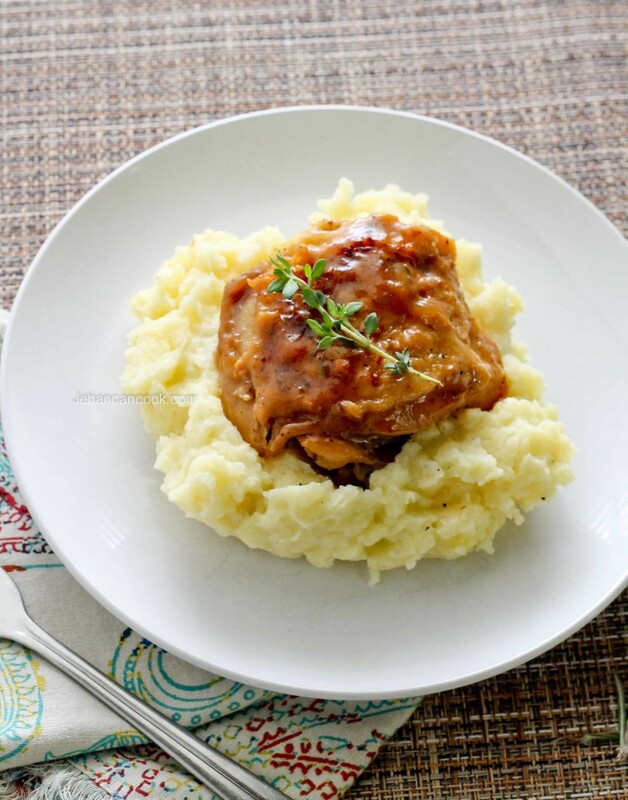 I’ve already made one of my favorite Fall dishes and it’s thisApple Cider Glazed Chicken. 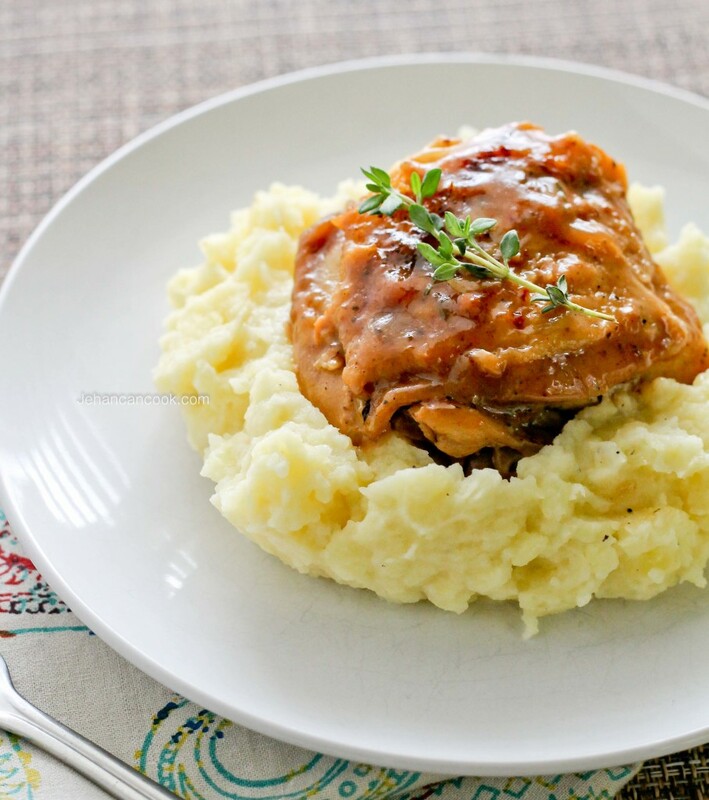 You guys, it’s really, really good; the chicken is glazed with a savory sauce that made by reducing apple cider while garlic, rosemary and thyme give the sauce a savory flavor. 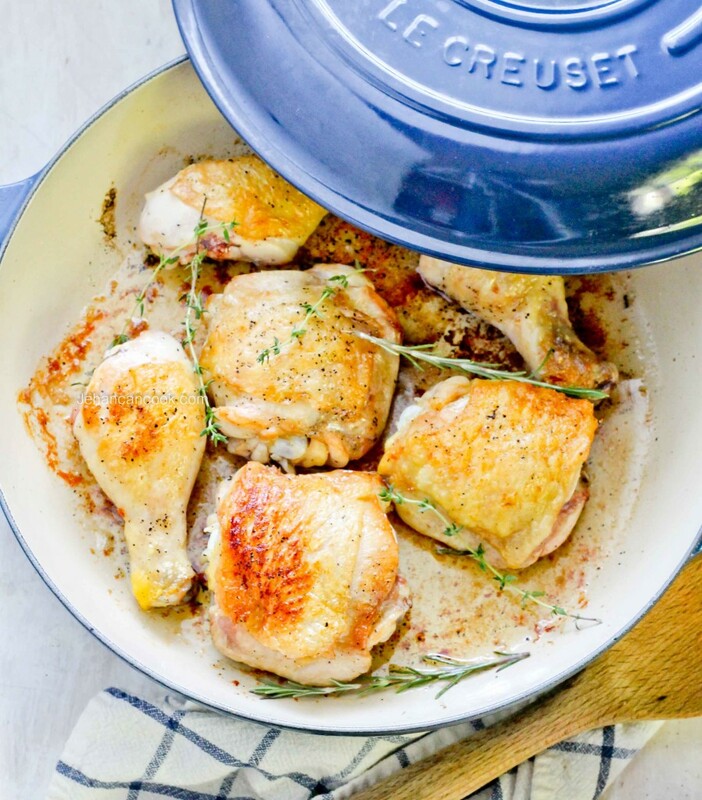 I used my new Le Creuset Cast Iron Braiser which browned the chicken beautifully. I highly recommend having as least one cast iron pot; it conducts heat well as it heats slowly and evenly and is less likely to burn your food. If you’ve visited my blog long enough then you will notice that I’m all about simple dishes that don’t take a lot of time or special skills but pack a lot of flavor and this dish it all of that! What are your favorite fall dishes? Do you go pumpkin and apple crazy like I do? Wash and dry the chicken using a paper towel. Sprinkle with salt and pepper on both sides. Heat oil over high heat in a large pot; when the oil is hot, add chicken skin side down. Cook chicken until the skin is golden brown, about 5-7 minutes; if the skin sticks to the pan, it is not ready, let it cook for a minute or two longer until you can easily turn the chicken with skin intact. Turn the chicken and cook on the other side for an additional 5 minutes. Remove chicken from the pan and place onto a plate. Use a spoon to carefully remove excess oil from the pot. You only need about 1 tsp of oil. Return the pot to the fire and add onions, garlic, rosemary and thyme and cook for 1 minute; add apple cider and stir to mix the browned bits from the pot into the sauce. Add chicken and bring to a boil. Cook for until the sauce has reduced and thickened, basting the top of the chicken occasionally. Remove from heat and serve. I received the Le Creuset Braiser as a gift but was not compensated for this post. As always all opinions are my own.